Mt. Khangchendzonga, the world’s third-highest peak is revered by the people of Sikkim as their protective deity and is located on Sikkim’s border with Nepal. Little wonder that this tiny former Himalayan kingdom is such a haven for travelers. The nearest airport is Bagdogra (in West Bengal). Consider booking flight tickets well in advance, for cheaper fares. I booked mine a month in advance. Gangtok is 124kms away from Bagdogra. From Bagdogra, you can also take a TSA helicopter to get to Gangtok in just 20 minutes. However, their services depend on the weather conditions. The nearest railway station to Gangtok is about 148 kilometers away in New Jalpaiguri in Siliguri. The station is well-connected to major cities like Kolkata and New Delhi. 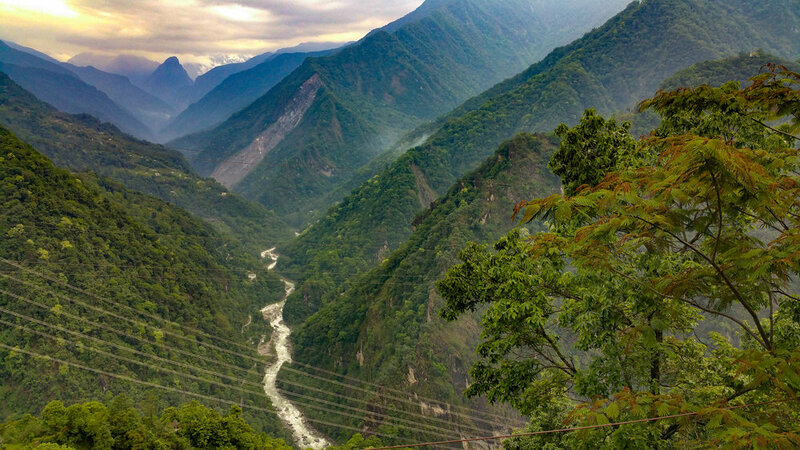 From New Jalpaiguri, you can take a taxi to Gangtok or go to Siliguri Bus Station and catch a state-run bus to Gangtok, which will take you about 5-6 hours. Summer (March – June) The summers are the best time to visit North-Sikkim as the weather, though on the cooler side, is pleasant. 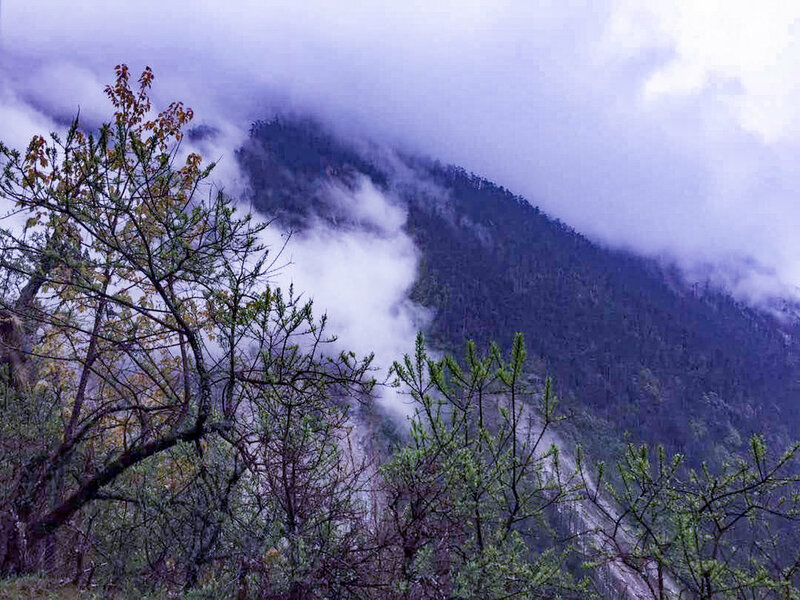 Monsoon (July – September) The monsoons, though not ideal, are a good time to visit North-Sikkim. My flight from New Delhi landed at Bagdogra airport around 1 pm. It took me another five hours to reach to Gangtok. I checked into Silk Route Residency and after taking a shower took a stroll around the MG Road. 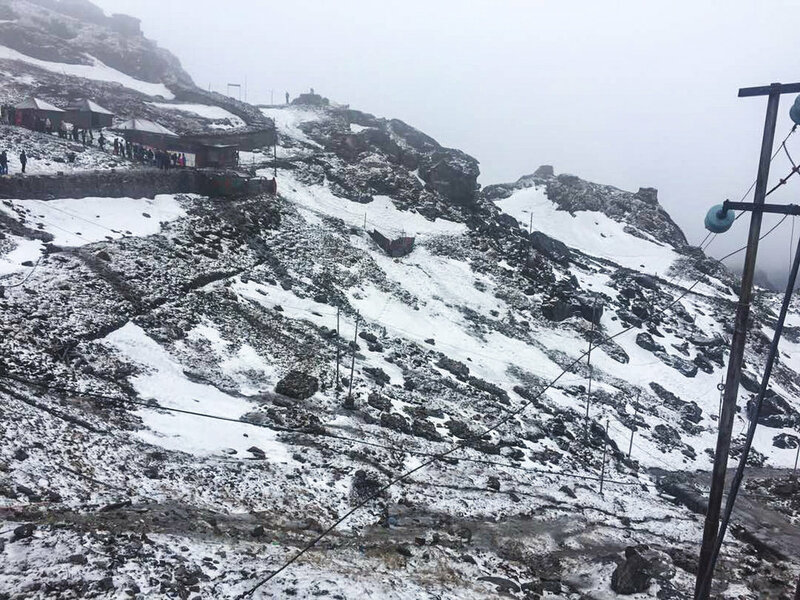 After shopping around and quenching my crave for the much-hyped momos (that lived up to their expectations), I retired early to bed as I had to leave very early for Nathu La Pass the next morning. I woke up to the news that there was some discrepancy with my travel permit (you require to obtain a travel permit to visit Nathu La. More details below). 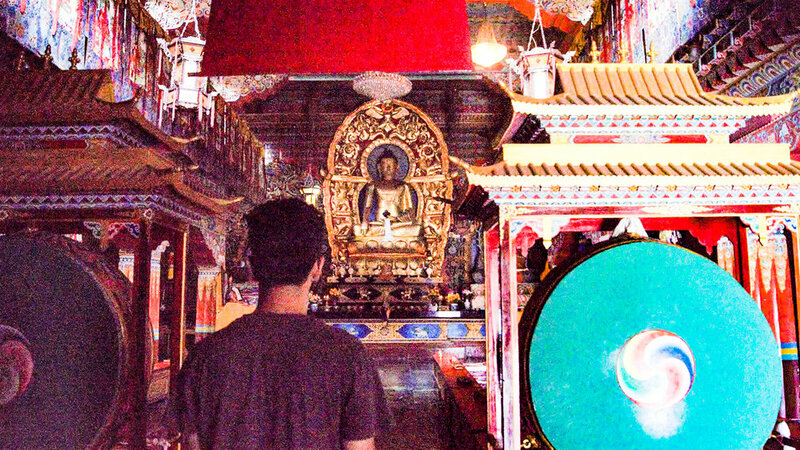 And so, instead of getting dismal about it, I decided to go and explore places around Gangtok. It’s a museum created around a waterfall and beautifully maintained by Sikkim Tourism. After hopping a few more typical tourist sight-seeing spots like Ganesh Tok, Tashi Viewpoint, flower exhibition center and having a nice lunch, I hired a taxi to visit monasteries. It was recommended by a travel enthusiast friend. This was my first visit to a monastery, and I am not exaggerating – one of the most beautiful moments of my life! The moment I stepped inside, I was surrounded by such calm and peaceful vibes. The interiors were intricate, minimal and very detailed. Monks, draped in traditional robes, flocked the monastery, all drowned in their own activities. Some sat in prayers, some played the gyaling – a traditional woodwind instrument of Tibet – and others sat outside studying. I met two meditative cats, gray and black in color. 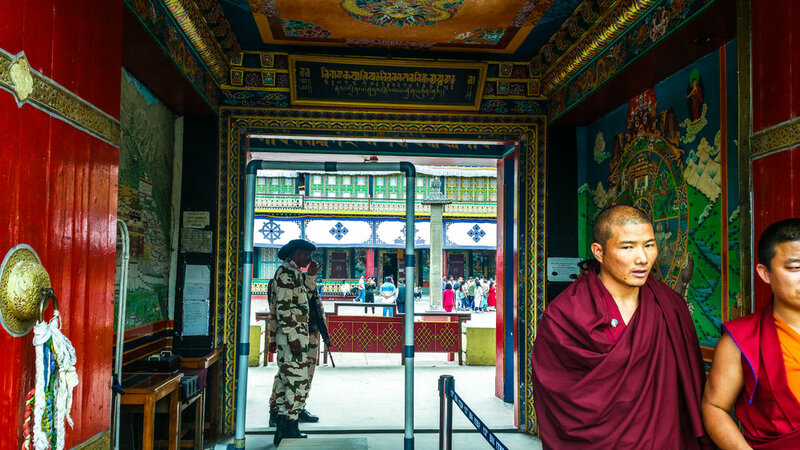 The monastery visit left a lasting impression, and I knew at once what I will be re-visiting Sikkim for. [Always trust experienced people for alternatives!]. One of the more famous monasteries, there is a kilometer long walk to the main entrance after the taxi driver drops you. A very beautiful and enthralling walk, that would not be tiring at all. 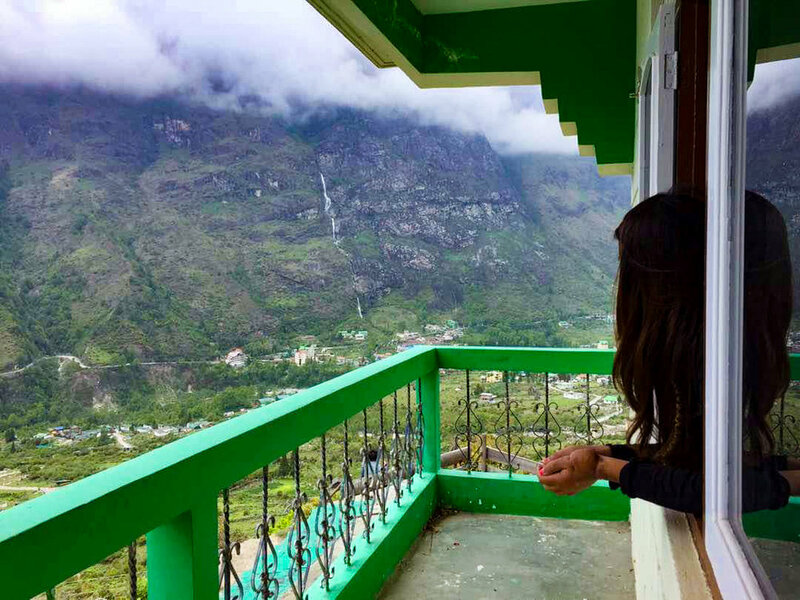 “DO NOT FORGET TO TAKE YOUR ID CARD HERE FOR ADDRESS PROOF.” After reaching the monastery, I sat on its terrace gazing at the most beautiful mountain view for hours.After the monasteries visit we came back to the hotel. 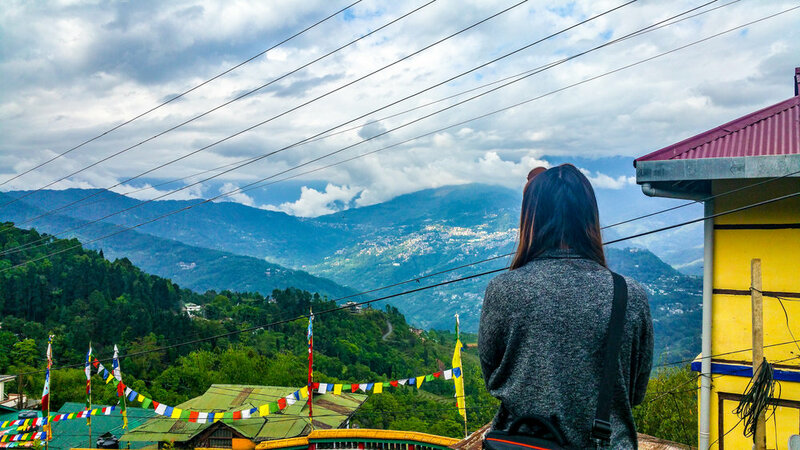 I was falling in love with Sikkim a little more every day. At around 1 pm, we started for Lachen. It is a small town, about 124 km from Gangtok. From the local taxi stand, it took almost 7 hours to reach there, so I will suggest you guys leave as early as 8 am for Lachen. I spent most of the day traveling, halting the cab at some very beautiful scenic point, crossing many waterfalls, and bridges (I have literally lost the count!). The terrain is a little rough, but the view during the journey compensates. Finally, I checked into Hotel Hill Retreat at Lachen and had a hearty dinner. I got up at 5 AM, to a beautiful Sun greeting me, and started the journey towards Gurudongmar Lake. The road leading from Lachen to the lake is almost 65 km and it took almost four hours to reach there. Again, it is always recommended to start your day early, so you can visit the lake and return by afternoon. 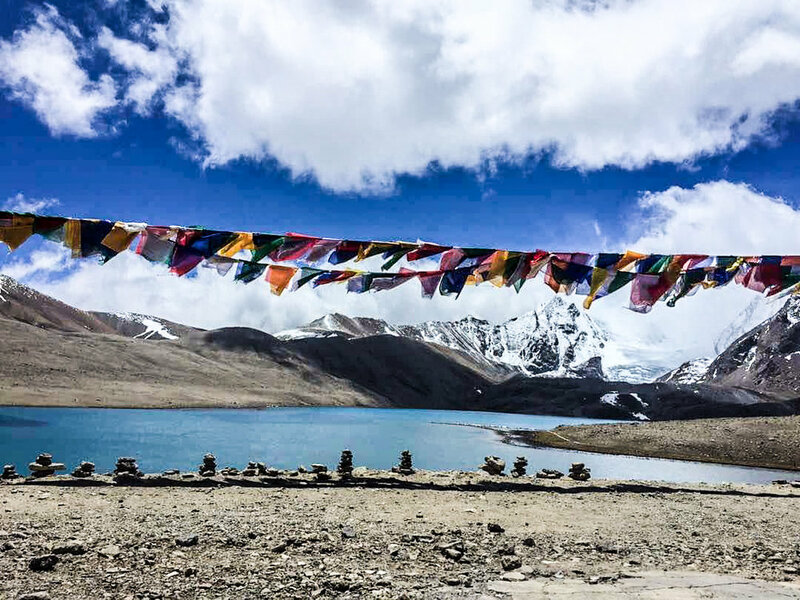 It is one of the highest lakes in the world and is considered sacred by both Buddhists and Sikhs. 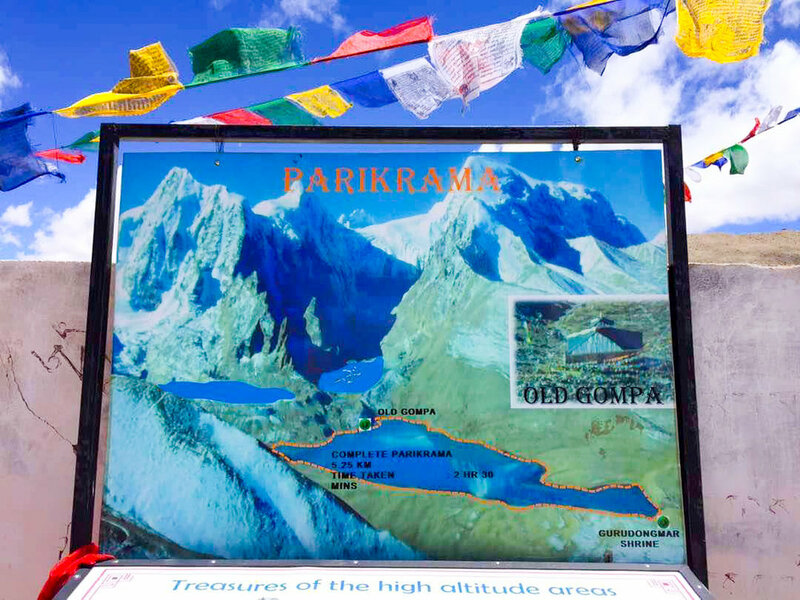 The lake is blessed by Guru Padmasambhava and also by Guru Nanak, and you can start feeling the sacred vibes once you are in its vicinity. The lake remains completely frozen during the months from November to Mid-May. China border is 5 km on the eastern side of the lake. After spending 45 mins at the lake, I started my journey back to Lachen, where I reached at 4. As the lake is situated at an altitude of almost 18000ft. you can face breathing issues there. so two days in advance start taking medicine like Diamox [after consulting your doctor of course]. Kids or people with breathing issues should think twice before going here. A 2-hours stretch terrain is so rough that, all your body shake and might hurt, so be prepared for that. Lachung is 50 km from Lachen and it took almost 2 hours to reach there, including time spent at “Amitabh Bachchan waterfall”. yes, it’s a real place. Our hotel at Lachung was ‘oh so beautiful’! Of all the places I have been to, I had the most scenic view from here. Can’t forget that moment when all I did was sit on the bench outside our room and gazing at mountains. I can go back to Sikkim just to stay in that hotel again. We left for Yumthang Valley at 6 in the morning! Also called as, Valley of Flowers, with a river, hot springs, yaks and grazing pasture on rolling meadows surrounded by the Himalayan mountains! It took 2 hours to reach there from Lachung. Of all the time I spent in Sikkim, that half hour sitting near a bridge surrounded by numerous prayer flags will always stay with me. There was no one around and all I could hear was the sound that Teesta river made. some birds flying over and the sound that the flags created because of the wind pressure. I did not want to get up from there but I had to because I had to reach Gangtok by evening! So after spending some time in Yumthang Valley, we started for Lachung. there was a different kind of silence inside my body while I was leaving that place. Such places do that to me. After reaching Lachung we had our lunch and started for Gangtok around 3 pm. We stopped at multiple points again and reached Gangtok around 8 PM. And the second last day of the trip was everything. Adventure, emotions, spirituality, patriotism! Finally, at 8 AM, I started for Nathula Pass. 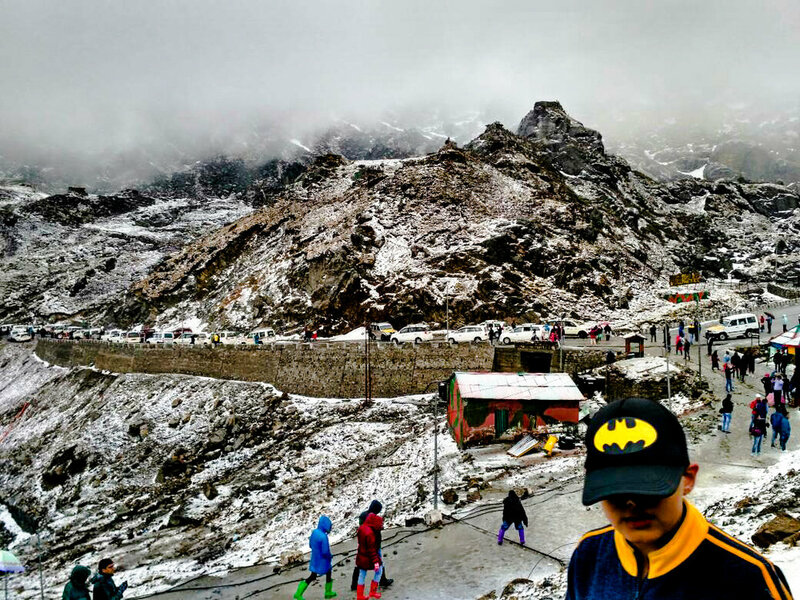 For top 7 things to do and see in Sikkim you can check my post here. Nathula pass is the border between China and India. It can rain/ snow at almost any time of the day making the temperature go as low as -1-degree Celsius. Nathula is 57 km from Gangtok and including the time taken to reach to the check post, it took around 4 hours to reach there. It is 14000 ft above sea level. Apply for the permit at least 4 days before. Keep multiple passport size photos and your ID proof with you for the permit form. Carry a raincoat or umbrella. Avoid traveling with your kids, because of temperature and breathing issues. wear gripped shoes for snow. Photography is prohibited so you can give a rest to your cameras. As per our itinerary, we were to leave for Darjeeling after reaching Gangtok around 6. After we started from Nathula Pass, we took a stop at Baba Mandir. This temple is dedicated to an Indian army soldier Baba Harbhajan Singh who died in 1968 near the Nathu La. Indian Army personnel who are posted around Nathula Pass have come to believe his spirit protects every soldier in the inhospitable high-altitude terrain of the Eastern Himalayas. This mandir has a very different vibe, that you will feel if you will stand inside the temple! So while we were there, one army personnel told us to hurry up as multiple landslides happened en route Gangtok. We rushed back to our cars and just after a few kilometers we were stuck because of the landslide. And as it was a Sunday, the labor was on leave so we had to wait for a JCB machine to clear the mess, that took more than 4 hours, with help from the army, volunteers and the generous local people. Finally, I reached Gangtok at 11 PM and did not leave for Darjeeling. Now I have a flight at 1 and Bagdogra is almost 5 hours from Gangtok, I took a cab around 6 and left for the airport. Book a taxi and visit Darjeeling. You can do local sight seeing there. You may visit Tiger hills or Darjeeling zoo. Book a taxi and go to Nepal border for shopping. 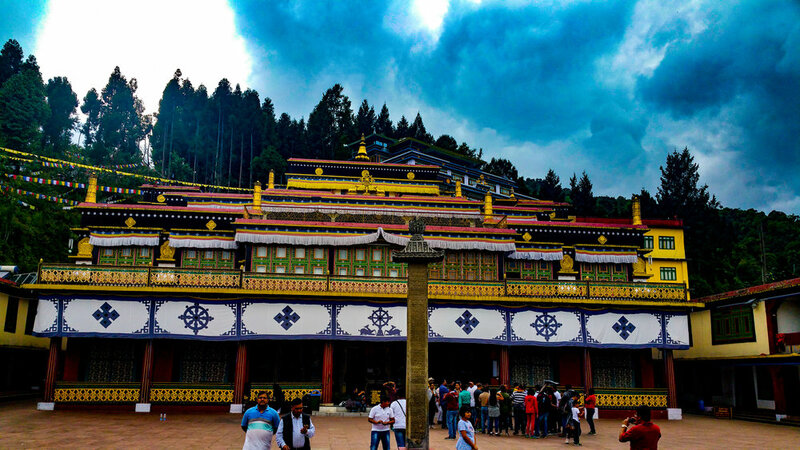 Visit Namchi for The Namchi Monastery, Ralang Monastery, and TendoHill. 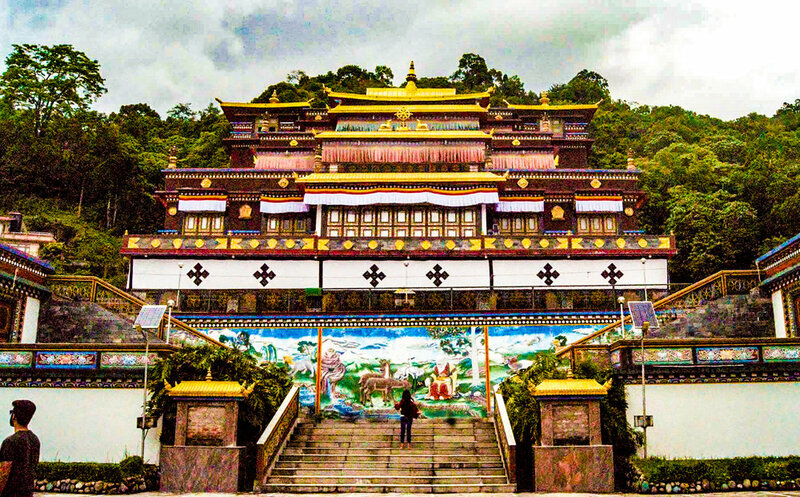 The world’s largest statue of the Buddhist Padmasambhava, also known as Guru Rinpoche, the patron saint of Sikkim, is on the Samdruptse hill (The Wish Fulfilling hill) opposite Namchi. Make the choice as per availability of time! If you have any query or need any suggestions, do comment below and we will make sure to revert as soon as we can! This was shot in May 2017. We covered Nathula La, Lachen, Lachung, Gangtok.